To beat the crowds, the best route is to use the Capital Line to Bay/Enterprise Square station and walk a couple short blocks. Extra trains will be operating during games and major events. Nearby stops: Bay/Enterprise Square, Churchill, Central, MacEwan and Corona. Taking a bus to Rogers Place is easy. 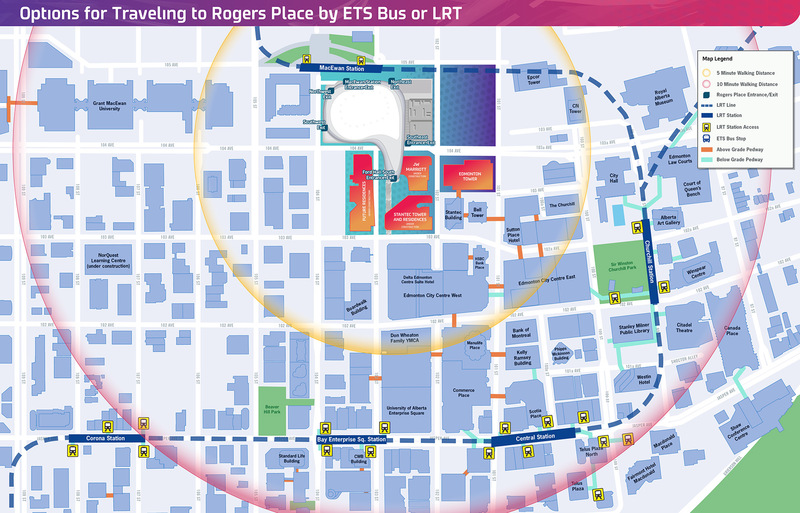 There are over 40 bus routes within walking distance of the arena during weekday service. On evenings and weekends routes 1, 2, 3, 5, 7, 8, 9, 15, 57, 100 and 151 are within walking distance of the arena. Plan your trip at takeETS.com or call 311 for route and schedule details.